According to Forbes magazine, 70 percent of senior citizens have no dental coverage, because when senior citizens reach retirement, they often lose the dental benefits they previously had through an employer’s insurance. Seniors then enroll in Medicare, which offers no dental benefits, leaving retirees living with limited income and resources struggling to afford routine oral health care. Most seniors qualify for Medicare at age 65, but unfortunately the Medicare program does not provide dental benefits. Unless seniors have a supplemental dental insurance plan, they may be on the hook for 100 percent of their dental bills. Medicare does make an exception for senior citizens who are undergoing a Medicare-covered medical procedure that requires dental work to perform the procedure. For example, the Centers for Medicare and Medicaid Services states that Medicare will pay for tooth extractions in order to prepare for radiation of neoplastic diseases in the jaw. Seniors with very low income may enroll in Medicaid to help supplement Medicare. According to the Kaiser Family Foundation, almost 9 million seniors in the U.S. qualify for dual enrollment in both programs as of May 2011. Medicaid helps pay for Medicare premiums and may help fill gaps in dental coverage. Each state determines whether or not it will provide dental benefits to adult Medicaid enrollees over age 21. According to the Centers for Medicare and Medicaid, almost all U.S. states provide at least emergency dental care coverage, but less than half offer comprehensive dental benefits for adults. 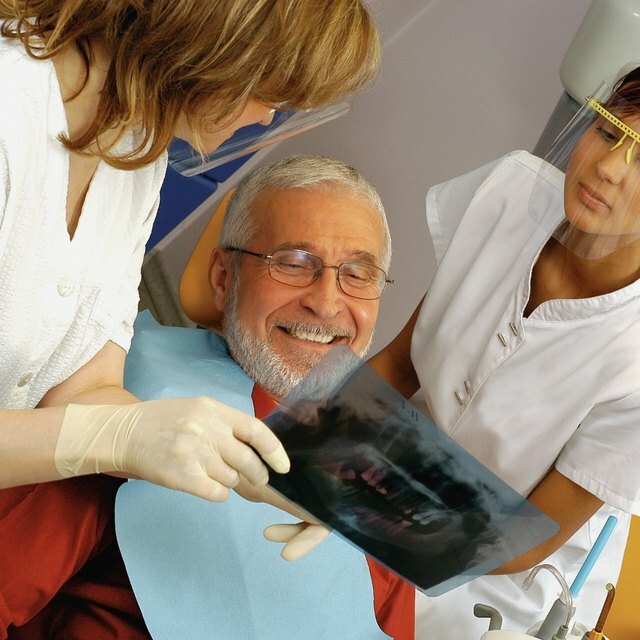 Some seniors may find affordable dental care at community health clinics. For example, the New Jersey Division of Family Health Services publishes an extensive list of dental clinics located throughout the state that provide free or reduced-cost dental care to low-income individuals of all ages. Many clinics accept only patients with financial need and will charge for services according to each patient’s household income and ability to pay. Low-income seniors without access to dental benefits through Medicare, Medicaid or a local dental clinic may have to purchase a dental plan to make care more affordable. Unlike dental insurance, which charges a monthly premium, individuals typically pay a single annual fee to enroll in a dental discount plan. Forbes suggests that these plans are more affordable in the long term because most cost approximately $100 per year, have little or no waiting period and provide reduced dental fees from a network of participating dental providers. For a low-income senior, this equates to a cost of approximately $8.33 per month but could yield dental discounts of up to 50 percent or more.